The company's second 14 nm chip has been announced earlier than expected, but mass production is expected to begin "in late 2015." One day after the rumor claiming that Samsung mass produces the Exynos 8890 chip already, the latest member of the Exynos family gets announced in a post on the Samsung Electronics Official Global Blog, Samsung Tomorrow. 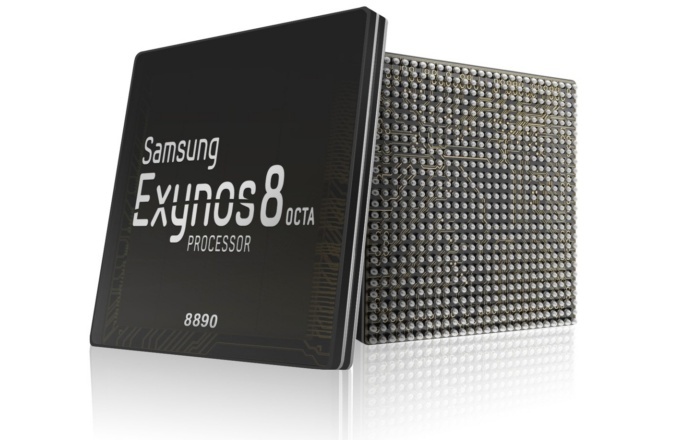 Samsung Exynos 8 Octa 8890 is the direct successor of the Exynos 7 Octa 7420 and the second of the company's processors built on 14 nm FinFET process technology. According to Dr. Kyushik Hong, Vice President of System LSI marketing, Samsung Electronics, "The Exynos 8 Octa is a leading-edge application processor for next-generation mobile devices that incorporates Samsung’s mobile technology leadership in CPU, ISP, and modem as well as process technology." The new one-chip solution integrates Samsung's first custom designed CPU based on 64-bit ARMv8 architecture, the latest LTE Rel. 12 Cat. 12/13 modem, as well as the ARM Mali-T880 GPU. Samsung claims the Exynos 8 Octa provides over 30 percent improvement in performance and 10 percent in power efficiency over its predecessor. Since the company plans to begin mass production of the Exynos 8 Octa 8890 "in late 2015," the handsets to use it should start to come out next year and probably the next-gen flagship Samsung Galaxy S7 will be the first one.